I, Evan Olander, am happily married and together with my wife Leah, have three amazing children, two little boys and one little girl. They are one of the biggest reasons why I got into the inspection business. 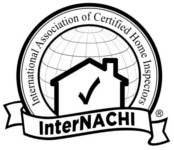 Another big reason why I decided to become a home inspector is because I love working with people and I really enjoy the "detective" work that goes into every home inspection. At the end of the day my main concern is to help inform potential home buys and sellers of the surprises that they would not have seen had they not received a professional home inspection.